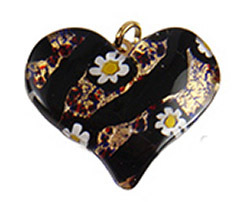 Fantastic Bold Colors of our fused Murano Glass pendant heart. This one is slightly curved making it lay beautifully against your neck. It's easy to create your own Murano Glass Jewelry by just adding one of our cords to your piece. The bail is glued on to the back and is either gold tone or silver tone. The size on these is approximately 40mm cross and 30mm top to bottom. Authentic Murano Glass Pendants.